Five years after a terrible mining accident, Clare arrives in the remote town of Blackmore. She arrives undercover as a photographer and investigates the disappearance of Shayna Fowles, a Blackmore resident. Over the span of a week, she immerses herself into the community and pries into the lives of the residents. She hopes to uncover the details surrounding Shayna's disappearance. 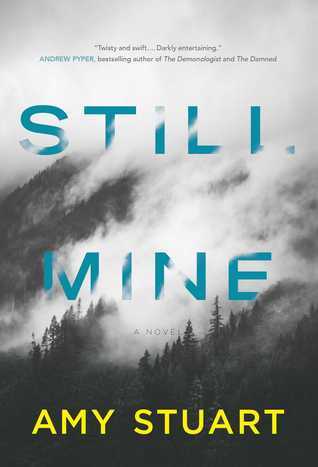 Still Mine is a thrilling debut novel from Canadian author, Amy Stuart. It is a dark thriller that will take you on a journey to solve the mystery of one woman's disappearance which, at the same time leads you to learn more about the history and past of another. There were so many layers in this book that kept me engaged and flipping pages faster and faster. Each of the characters were carefully constructed and had back stories that just felt so believable. The mystery itself about Shayna's disappearance was so intertwined in these characters' pasts that there were moments where I really had no clue what was going to happen, this doesn't happen very often for me. It left me to question: Was Shayna really dead? Was she murdered by someone she loved? Or, did she just pick up and leave, similar to what Clare has done? The emotional roller coaster that this book puts you on is pretty awesome and I highly recommend lining up for the front seat. Readers who have enjoyed thrillers by Gillian Flynn and Joy Fielding should give Still Mine a try. An excerpt of the first two chapters is available via Amy's website located here. I finished reading it today, and my conclusion is that its a very interesting book to read. I got mine from Amazon and I got it in just 2 days.